Tue., April 10, 2018, 12:05 p.m.
JERUSALEM – Israel’s defense minister said Tuesday that a well-known Gaza journalist who was killed by Israeli gunfire over the weekend was a member of Hamas, an allegation denied by the Islamic militant group and the journalist’s family. Defense Minister Avigdor Lieberman provided no evidence to back up the claim. Yasser Murtaja died from a gunshot wound while filming a mass demonstration near the fence with Israel on Friday in an area engulfed in thick black smoke from Palestinians setting tires on fire. Hamas has called for Palestinians to amass at the border as part of a weekslong campaign of protests against a decade-old Israeli and Egyptian blockade of the territory. It also has suggested that it may attempt a mass border breach. Israel is closely guarding the fence and has warned it will not tolerate attempts to breach it. Twenty-six protesters have been killed and hundreds wounded since the protests began March 30. Israel says it has only fired at “instigators” trying to carry out attacks. Speaking to reporters Tuesday, Lieberman said that Murtaja was a “terrorist” who had been on the Hamas payroll since 2011. He said Murtaja had used a drone to collect intelligence on Israeli forces along the border. Lieberman provided no evidence to support his allegations. Israel’s military said it is still investigating and was not able to confirm Lieberman’s claims. Murtaja, 30, was the co-founder of Ain Media, a local TV production company that has done projects, including aerial drone filming, for foreign media clients such as the BBC and Al-Jazeera English. The State Department said Tuesday that the media production company had recently received an $11,700 grant from the U.S. government. Ain Media became a USAID program beneficiary last month under a program that supports private sector development. The State Department said the grant was still in its early stages, and no equipment or technical assistance has been provided. It said the grant was vetted according to strict U.S. government requirements of USAID-funded assistance. Murtaja had been hired to begin work for the Norwegian Refugee Council, a major international aid organization. The group released footage showing what it described as his “last work.” He died two days before he was to start his new job. The footage, taken at a protest a week earlier, shows several aerial shots of tires being set on fire near the border fence, wounded protesters being rushed to medical tents as well as other shots, apparently taken from the ground, of an Israeli tank and Israeli troops off in the distance. In Gaza, Murtaja’s brother, Mutasem, angrily denied Lieberman’s claims. 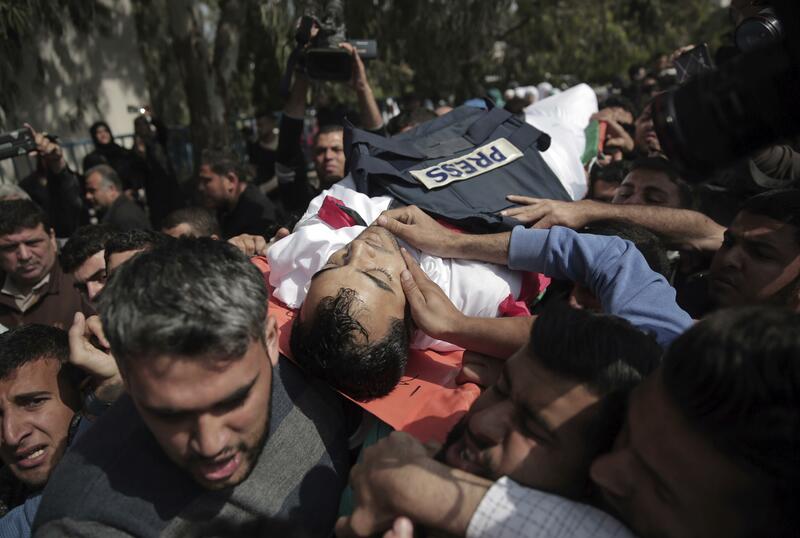 At the funeral Saturday, Murtaja’s body was draped in a Palestinian flag with his flak jacket reading “press” placed upon it as it was carried through the streets of Gaza. Hamas’ leader, Ismail Haniyeh, attended the funeral in a sign of respect. But no gunmen were visible at the ceremony, as is common when members of militant groups are buried. Hamas, a militant group sworn to Israel’s destruction, has called for the protests to continue until May 15, the anniversary of Israel’s founding, when Palestinians commemorate their displacement during the 1948 war over Israel’s creation. Hamas hopes the protests can create pressure to break a border blockade enforced by Israel and Egypt since 2007, when Hamas took over Gaza, without the militant group being forced to disarm. Israel has accused Hamas of using the recent protests as a cover for carrying out attacks and trying to infiltrate Israel. It has said some of those at the border tried to damage the fence, planted explosives or hurled fire bombs. The army says it uses live fire as a last resort, and only on attackers. Also Tuesday, Israel released the results of an investigation into video footage in which soldiers are heard cheering as a sniper shoots a Palestinian along the border. The army said the video was not from the recent unrest, and was taken in December when protesters allegedly tried to damage the border fence. The video, apparently taken from a sniper position, appears to show a soldier shooting a Palestinian near the fence. Other soldiers are heard cursing the man and then cheering when he falls. The military said the man was a main instigator in the clashes and was shot in the leg and wounded after ignoring warning shots and calls to halt. The statement said the footage was not filmed by the Israeli sharpshooter but by a soldier from a different unit. It condemned the filming of the incident and the statements the soldiers made. It said the troops’ behavior does not reflect the army’s values and they will be dealt with “accordingly,” without elaborating. Published: April 10, 2018, 12:05 p.m.